Any food safety expert will tell you that a quality sanitization program is not just about what kind of chemicals are used or what skilled sanitor is doing the work. It is a microbiological formula that requires both sides working together closely to monitor and manage the specific needs of a production plant and train employees to execute consistently. Unfortunately, this process can still be very fragmented in most USDA, FDA, and CFIA plants today. Often times chemicals are ordered, sometimes among disparate suppliers, completely separate from an interaction with the sanitization service experts. The problem is, this leaves many potentially costly gaps in the process that can be extremely risky for overall effectiveness of the plant’s sanitization program, but also the safety of the employees. And if a situation were to arise related to a foodborne illness outbreak or product recall, who is ultimately responsible? Maybe it was an issue with the potency of a certain chemical, how the chemicals were mixed, or even the method in which it was applied? The answer is not always upfront or obvious and it can sometimes be difficult to determine a cause when numerous vendors are involved in the process. Unfortunately, this can oftentimes result in time consumption and costly finger pointing, investigative, legal headache, but more importantly a gap in food safety, loss of production and damage to your brand’s reputation. This kind of fragmentation with your sanitation efforts, while usually done in an effort to save money and maintain greater control, oftentimes ends up weighing significantly more on your internal resources and sanitation expenses in the long run. And, more importantly, it puts people’s safety at risk – the employees and end consumers. PSSI has been a leader in the Food Safety and Sanitation business for more than 45 years. Our sister chemical company, Packers Chemical Inc. (PCI) is one of the largest cleaning, sanitizing, and specialty chemical providers. We’ve served thousands of partners across the U.S. and Canada in various capacities together and separate, so we’ve seen both sides. Injuries are one of the leading disruptions to any sanitization program. It is critical that sanitation teams work with the exact same products and handling procedures, including color codes and chemical strengths, they are trained on to prevent injury. When PSSI employees are trained and familiar with PCI chemicals, this will naturally lead to fewer accidents and disruption to production time. When PSSI employees are trained and familiar with PCI chemicals it helps increase cleaning efficiency necessary to get quality plant sanitation completed on time. The ability to mobilize support wherever and whenever needed is also an important aspect to complete nightly plant sanitization. If the chemicals are consistent at each partner location, it significantly increases the training efficiencies needed to keep the sanitation program operating at full-speed. Inventory management of sanitization chemicals and products are significantly more difficult when there are numerous vendors, resulting in product waste when not centrally managed. PSSI and PCI work together to manage familiar inventory and handling procedures to ensure the products are being used effectively, which results in lower product costs for our partners. If we overuse or damage inventory of chemicals inventory, that liability falls on PSSI, not your program budget. 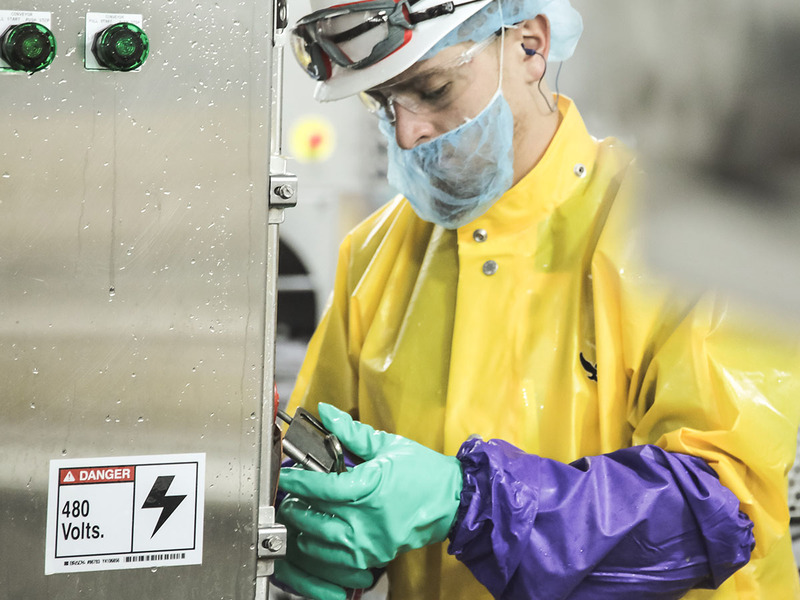 When you have one food safety partner managing all the products, chemical handling procedures and services as part of your sanitization program, there is clearer accountability for who is responsible in making sure the job gets done right. If a situation were to arise related to an injury, foodborne illness outbreak or product recall, actions can being taken more quickly to investigate or resolve the issue when resources and communications are more clearly defined. Sometimes there are specific needs that arise for a sanitization program due to unique plant environmental or equipment changes that require custom adjustments to be made. PSSI works directly with our chemical experts to manage the needs and respond quickly. Additionally, there is benefit to you with PSSI having direct access to a wide range of chemicals and chemical dispensing equipment beyond food safety and sanitation programs such as general plant cleaning or worker hygiene. The brand and financial risks are simply too high in today’s food production industry that we’re seeing played out in the news on almost a daily basis. Sanitization has a higher purpose than simply cleaning the plant. It is taking every possible step to advance food safety and sanitation methods to protect your consumers and business. Together, PSSI and PCI have the tenured experience with expert resources, including on-staff microbiologists, chemists, sanitation specialists, as well as safety and technical design experts, to provide a complete program solution that will drastically minimize your risk so you can focus on managing and growing your business.